Is lowering the fees cap the right policy? Reforms introduced by the Blair government in 2006 provided a progressive strategy for financing higher education, a strategy on which further reforms in 2012 failed to build (Barr 2012). In response, the Labour Manifesto (2015) proposes a reduction in the cap on tuition fees from £9,000 to £6,000, a policy supported by the SNP Manifesto (2015). This note provides a toolkit for assessing that policy. Section 1 sets out the problems with current arrangements and section 2 policies to improve the system. There is a good case for some additional taxpayer support for teaching, but the proposal to lower the fees cap is the wrong method at the wrong time. Taxpayer support for teaching in the arts, humanities and social sciences is inadequate in that it ignores their public benefits. The level of income at which graduates start to repay their student loans is too high. The resulting high fiscal cost of loans crowds out desirable spending in other parts of the education system, with adverse effects on efficiency and equity. In the presence of the second problem, it is an analytical error to consider the first in isolation. To expand the loan system, for example, to increase the maintenance loan and to extend loans to postgraduates and part-time students, to other parts of tertiary education, and perhaps also to apprenticeships. To restore pro-access interventions earlier in the system, for example Education Maintenance Allowances and AimHigher, which were wrongly abolished in 2012. It should not come first. The current problems were both predictable and predicted (Barr and Shephard 2010). The concluding paragraph of my assessment of the 2012 reforms (Barr 2012, p. 504) argued for a strategy with three mutually-reinforcing elements: (a) restoring some taxpayer support for teaching, (b) reducing the fiscal cost of student loans, and (c) spending more earlier in the system to widen participation. Higher education creates both private and public benefits. The private benefits include higher earnings on average and more enjoyable jobs on average. The public benefits arise in several ways. They include the additional tax payments resulting from the higher earnings of graduates. There are also potential production benefits in the form of higher growth rates: it is not surprising that much high-tech industry occurs in clusters near leading universities. And cultural benefits include increased civic engagement and shared values. That some of the public benefits are hard to measure does not make them unreal. Furthermore, the case for widening and deepening human capital is not simply as investment, but also as insurance (under-investing risks being overtaken by South Korea). 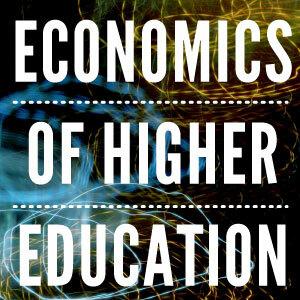 It is a standard proposition in economic theory that where an activity like higher education generates a public benefit over and above that to the individual, the market will generally produce too little of that activity. Thus it is both efficient and fair that the costs of higher education should be shared through a combination of taxpayer subsidy, reflecting the public benefits, and tuition fees, reflecting the private benefits. This was recognised by the Blair government’s introduction and subsequent extension of tuition fees, and it is good that the current Labour proposal continues to acknowledge that point. The present system deviates from well-designed cost sharing in two ways: taxpayer support for teaching is inadequate, and the design of the loan system is unnecessarily and undesirably costly. The 2012 reforms abolished taxpayer support for teaching in the arts, humanities and social sciences and thus fail to reflect the resulting public benefits. Though the case for cost sharing is recognised, the size of the subsidy matters and so does its design. Method 1: It is argued that the large deficit in the current loan system is a form of subsidy. That approach, however, has the wide-ranging ill-effects discussed in section 1.3. Method 2: Lowering the fees cap and restoring the lost income to universities wholly or in part from taxation. That approach has a several deficiencies. Adjusting the fees cap is a blunt instrument for targeting resources. With the current loan design, only better-off graduates repay their loan in full. Thus reducing the fees cap mainly benefits high-earning professionals in mid career. If loans were better designed (section 1.3) the effect would be less marked but would still remain. A policy to restore universities’ lost income, if combined with the highly desirable policy of relaxing or removing the cap on student numbers, creates an open-ended funding commitment. Method 3: Retaining the current fees cap and, when fiscal conditions allow, providing additional, tax-financed support for teaching. That support could be a fixed sum per student, in which case the direct distributional effect would be broadly neutral. Alternatively, Barr and Shephard (2010) discuss the idea of and rationale for an arrangement with two characteristics. First, there would be more taxpayer support per student for universities that charge lower tuition fees. The result would be progressive and, for reasons that Barr and Shephard explain, can be justified also on efficiency grounds.3 Second, to allow the Treasury to control public spending, such teaching support could take the form of a block grant covering n students at a given institution; the institution would be free to provide more than n places but would receive no additional teaching support for the extra students. Better loan design (discussed below) would remove the current inefficient incentive to charge the maximum fee, exerting downward pressure on fees at some institutions. More generally, this approach has the potential for more refined targeting of taxpayer resources. Private benefits should generally be paid for by the beneficiary. However, students are credit constrained and hence generally cannot afford to pay fees. The purpose of student loans is to make higher education free for students, enabling them to pay for their private benefits when they can afford it, i.e. as graduates rather than students. In the language of economics, loans are a device for consumption smoothing. Saying the same thing in more political terms, with a well-designed loan, access to university is determined by people’s ability to learn, not their ability to pay. However, borrowing to finance a degree is risky because there is no physical collateral, so efficient consumption smoothing requires an element of insurance. In the UK, income-contingent repayments organised as a payroll deduction provide insurance against low current earnings, and write-off after 30 years provides insurance against low lifetime earnings. But (a) it remains the case that loans are primarily a device for consumption smoothing and (b) resources to widen participation are more effective when spent earlier in the system (Chowdry et al. 2013) than on subsidising loans. Thus, except for the insurance element, a well-designed loan should be broadly self-financing in present value terms, thus releasing resources better used for widening participation, improving quality, and expanding the system. Why does the cost of student loans matter? Most graduates should repay their loan in full. The reason is a simple: if loans are expensive in taxpayer terms they hinder the achievement of the economic and social objectives of higher education. Loans are too small and too few. Maintenance loans are too small, so students have to rely unduly on paid work and/or credit-card debt. The number of loans for postgraduate students is grossly inadequate, depressing the number of UK students doing postgraduate degrees, putting national competitiveness at risk. Loans for part-time students are inadequate: since this is one of the pathways to widening participation, access suffers. There are virtually no loans for other parts of tertiary education, lowering investment in vocational skills, and with adverse effects on access to higher education. Expensive loans crowd out other spending on higher education. Reduced taxpayer support for teaching and research potentially has adverse effects on quality and national economic performance. Or student numbers may be capped, with adverse effects on investment in skills and on access. Expensive loans crowd out policies to widen participation. The loan design spends money on those who have made it to university rather than on activities earlier in the system. The evidence that earlier intervention to improve GCSE and A-level performance is the most powerful way to widen participation is now very strong (Barr 2012, pp. 487-490; Chowdry et al. 2013). Thus the high repayment threshold benefits insiders at the expense of outsiders. In sum, the high cost of student loans harms the three central objectives of quality, access and size. A fuller return to taxpayer finance, for example the Green Party’s Manifesto (2015) proposal to end tuition fees and cancel student debt would have these damaging effects even more strongly. ANALYTICAL CONCLUSIONS. There are good grounds for subsidising a public benefit through some additional taxpayer support for teaching. However, the policy should not be considered in isolation but alongside the distortions arising from badly-chosen parameters for the student loan. Economic theory suggests that it is mistaken to address the first problem while ignoring the second.7 Specifically, the place of taxpayer support for teaching in the policy queue should depend on surrounding conditions. What is needed are the right policies in the right order. If it is not possible – for example because of fiscal constraints – to address all problems simultaneously, the balance of the argument suggests that the loans distortion should be addressed first. 1) Reduce the fiscal cost of loans by reducing the real value of the repayment threshold. Some or all of the remaining loss on student loans could be met from sources other than taxpayers (Barr and Shephard 2010). 2) Extend student loans in desirable ways including increasing the maintenance loan, expanding loans for part-time and postgraduate students and introducing loans for other parts of tertiary education and perhaps also for apprenticeships. 3) Increase spending earlier in the system to widen participation, for example Education Maintenance Allowances and AimHigher, or successor policies. 4) Review student numbers and research funding. Fixing these problems will not be politically easy. Increasing loan repayments by graduates is not a vote winner. A gradual recovery to a more sensible balance could be achieved by holding the starting point for graduate repayments constant. A period of extended austerity is not the time to elevate policy (5) to the top of the queue, with benefits mainly for better-off graduates, and crowding out more urgent priorities including quality, access, and spending on vocational training. Lowering the fees cap might have limited merit as a political quid pro quo for reducing the loan repayment threshold, but on its own uses scarce resources in a way that is both inefficient and regressive. The balance between taxpayer support for teaching and tuition fees should over time be adjusted by restoring an element of teaching grant. I suggest you read Joseph Stiglitz’ paper on the Theory of Screening, and then re-assess your economic evaluation. He points out that public provision leads to over-expenditure on education – as evidenced by projections of large scale write-offs of loans.